The master showman became an icon of the popular culture he gave us new ways to consume. If the medium is the message, as Marshall McCluhan famously said, then Steve Jobs embodied both. The Apple boss, who died Wednesday at age 56, leaves us as the world’s biggest iCelebrity – an icon of the popular culture he gave us new ways to consume. He brilliantly intuited that grabbing hold of the popular imagination – and not letting go, if only through sheer force of personality – was as key to Apple’s success as the game-changing devices his company produced. In this sense, he exceeded Bill Gates and set the standard for the new breed of digital wunderkinds like Mark Zuckerberg, who appeared very Jobs-like during his recent Facebook Timeline rollout. Jobs, a master showman, cut a thin figure, in black mock turtleneck shirt and jeans – echoing the sleekness, if not necessarily the flashiness, of the products he sold. 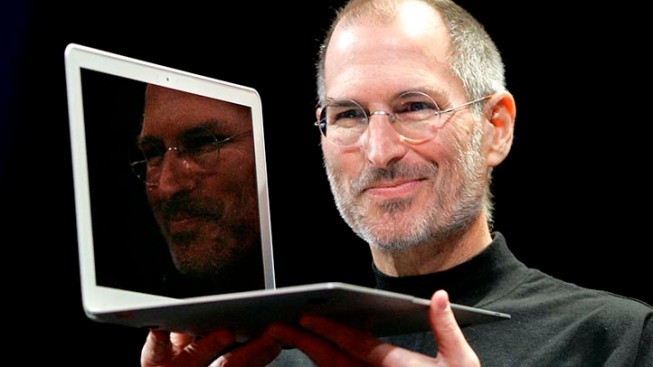 His genius rested not only in his talent for knowing what people wanted next but in persuading them their lives somehow would be empty until they bought his latest gadget or newest version. Standing on the stage at each new product rollout, most cloaked in surprise, Jobs proved part Wizard of Oz, part evangelist – promising to raise the curtain on a new, better life, in which the key to happiness could be held in the palm of the hand. Which is exactly where he held his many acolytes. He convinced us that we needed iPods and iTunes, giving us new ways to pick and listen to music. He helped create Pixar, which revolutionized movies, beginning in 1995 with "Toy Story" – the kind of flick now easily viewable on an iPad. He made geekdom cool by bringing must-have computers, smart phone and other electronic toys to the masses – gizmos that changed the way we relate to media and each other. Much of Baby Boomer Jobs’ success rests in his smart embrace of the popular culture he forever altered – the company’s very name was an ode to the Beatles’ Apple Records label. Apple's "Think Different" ad campaign invoked figures ranging from Gandhi to Bob Dylan to Jim Henson, offering multi-generational appeal and pushing the kind of emotional buttons found on no computer. Apple's famed "1984" spot brilliantly used iconography to target the establishment, in a youthful call to arms, with technology and innovation as the dual sledgehammer of change. Of course, the anti-conformity ad, which introduced the Macintosh computer, helped breed the Apple army that would later hang on Jobs’ every word. Even after he stepped down as Apple CEO in August because of health woes, Jobs' name stayed synonymous with his company. The talk about whether he would appear earlier this week at the rollout for the latest iPhone threatened to exceed the hype over the product. That final appearance wasn't to be. But as the outpouring spurred by his death demonstrates, Jobs remains the face of Apple and, for many, as an important a part of the popular culture as any entertainer or artist. Perhaps someone at Apple will be smart enough to re-cut the classic “Think Different” commercial – this time, adding images of Steve Jobs.